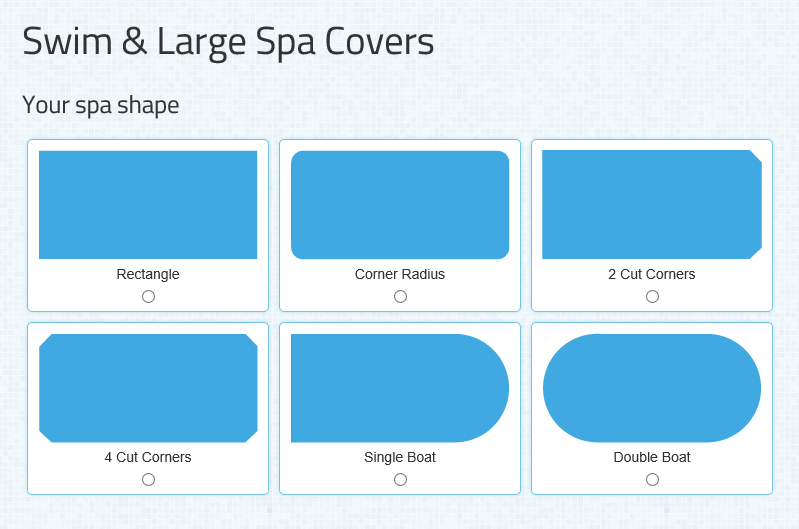 Here at spamaster we can make covers for Swim-spas, Exercise Pools, Oversized and free-form shaped spas. Due to the nature of these covers they require a slightly more detailed approach than when ordering a standard hot tub cover. However, we have streamlined the process and you can now order a swim-spa cover online for 99% of situations. A double-wrap vapour barrier around the foam core comes as standard and, depending on the dimensions, the cover can incorporate flat and tapered sections (to facilitate the run-off of water as much as possible). The foam core used in the cover is of 'Premium' Level 1, 2 or 3 grade, and our ordering system is 'smart' in that it recognises if an upgrade is possible for your particular cover, and is then made available to you as an option. A 'walk-on' option is also available, which will give the cover considerable additional structural strength and rigidity. We have many years' experience in the spa industry and have an in-depth knowledge of cover-systems and how they should perform. Call upon our expertise and we'll help you make the right choices. Order online and we'll liaise with you to ensure the final design meets your needs and the cover gives you years of durable, trouble free service. Alternatively, call us on 0333 6666 294 to discuss your requirements. Swim-spas are generally around 450cm in length, (but may be anything up to 900cm in exceptional cases), with a width of up to 240 cm. These larger dimensions present challenges over and above a standard hot tub, foremost among them is ensuring there is enough rigidity in the central cover/s, as these are only supported on the two short sides, (with the long side spanning the width of the swimspa). Compare this with a standard hot tub, where each half of the cover will be supported on three of the four sides. Most covers for swim-spas are essentially just two or three hot tub covers put together, and the result is a cover that is liable to sag over time. Here at Spamaster we can make proper swim-spa covers with the necessary structural integrity to prevent sagging. No, we aren't the cheapest, but if you want a properly made swim-spa cover that will last, give us a call! During the order process you will be presented with a visual representation of your new cover similar to the one shown here. You also have the opportunity to enter any comments during the order process. Once the initial order has been placed we will then work with you to ensure any modifications or specific requirements (such as position of handles or straps) are met. Most hot tubs and spas are below 2,44 cm x 2,44 cm (8ft square) but there will always be a small percentage of spas that are larger. Historically these have tended to be in-ground spas designed for commercial use but recent years have seen the introduction of theatre and party spas which can accommodate up to 11 people. These particular spas can be anything up to 380cm in length and in terms of size are more akin to a swim-spa, and for the purposes of cover manufacture, really should to be treated as such. Free-form spas have covers that are NOT capable of being reproduced purely from dimensions; they contain complex curves with multiple radii that are impossible to replicate accurately purely from a set of measurements. Some examples are illustrated below. There are really only two ways to accurately reproduce such a cover. If the old cover is still available the outer vinyl skin can be unzipped and sent to the factory to be used as a template. If the old cover is no longer available it is still possible to do but it will require making a template from the spa itself. Obviously this is a bit more involved, but we can supply a templating kit for this purpose. Simply email us at info@spamaster.co.uk or call us on 0333 6666 555.